If there is one thing that I have learnt from my 8 years of parenting so far, it is that kids learn so much more simply by just playing with toys. Fun toys trigger an inquisitive mind, and by playing with them leads kids to find solutions on their own which turns it into a positive learning experience for them. I received a set of Playbook complete with 12 Creativity Cubes, courtesy of ThinkersBox. ThinkersBox, as you may recall, is a cognitive training centre that prides itself in helping children develop and build their thinking skills for effective learning. Both Ash and Ayd have been attending its weekly session since the beginning of this year and so far, I am pleased with their progress. 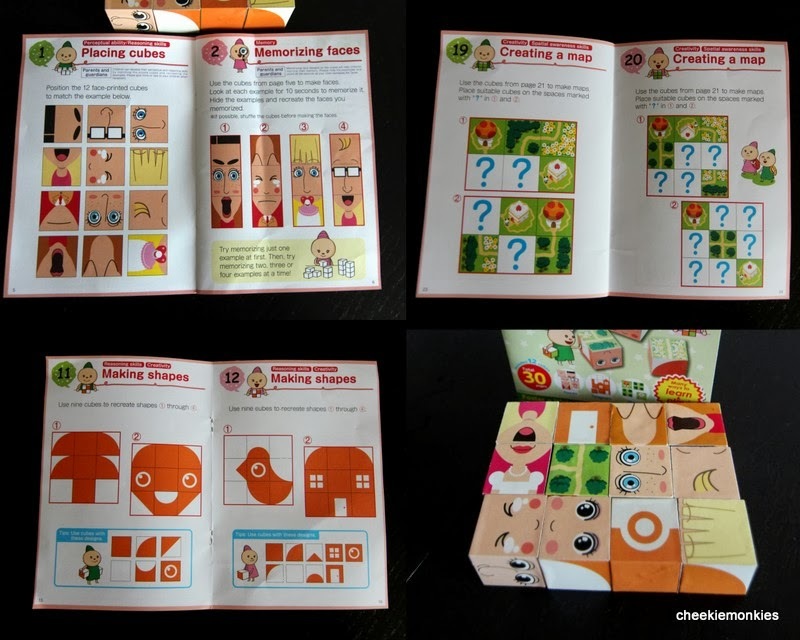 And now, ThinkersBox has launched the Thinkers IntelliBox - Singapore's 1st subscription-based 'Intellectual Development Kit' which is to be delivered right to the doorsteps of parents - and is designed to be a monthly kit filled with mini brain-based games, puzzles, worksheets as well as reading notes for parents. The playbook which I got was titled 'Creativity Cubes' with 12 cubes that allows a child to play in three different ways: composite portraits, tangram, and maze. Each game trains different skills such as reasoning, memory, creativity, and spatial reasoning capacity. Although this specific Playbook is recommended for kids aged 6 and up, Ale was the first one to be intrigued when I brought it home. In fact, she clamoured for me to pass her the book and cubes so that she could try her hands at Activity 1. The first activity required her to match the faces on the 12 cubes to their respective positions in the book and surprisingly, she managed to complete it without any prompting from me! Each monthly kit will provide materials for 20 days, encouraging parents to spend 5 to 10 minutes each day engaging their child in brain-stimulating activities. These activities are designed to be fun, interesting and stress-free and it clearly showed - all because Ale couldn't get enough and wanted more puzzles to solve! She chose the tangram puzzles next and while she found the basic shapes to be a breeze, things got a tad more complicated when it came to subsequent puzzles. Well it wasn't an issue for long, as her two brothers came to her rescue! Apparently, her two brothers' interest were piqued so much that they took over the entire Playbook after that... and co-operated on some maze-solving puzzles for the rest of the night. Depending on the age of your child, there are materials that are developmentally appropriate for children aged 4 to 7 years which have been designed and reviewed by a panel of Early Childhood Educators, Psychologists and Professors. All well and good... but the best part for me has got to be that the monkies did not even know that they were actually learning when playing with the Creativity Cubes! The 'Intellibox' subscription will be soft launching from 27 to 29 November 2013 at the upcoming Rise & Shine Expo at Suntec Convention Hall 401 this coming weekend (27-29 Sep 2013), from as low as S$1.50 per day. Be sure to check out ThinkersBox's Booth (Number F16) where you can find out more and bring your kids down to play with the sample kits to gauge their interest levels. And here's a special promotion: Parents who subscribe for the 'IntelliBox' at the Expo will receive additional free gift sets! *The subscription period will be until 30 November 2013 with its home delivery of the 'IntelliBox' beginning in January 2014.